大餅 (da bing) in Chinese literally means “large pancake.” They are really popular in Chinese restaurants. Crunchy on the outside, chewy on the inside, slightly salted, and covered in white sesame seeds, they’re an awesome substitute for rice at any meal. 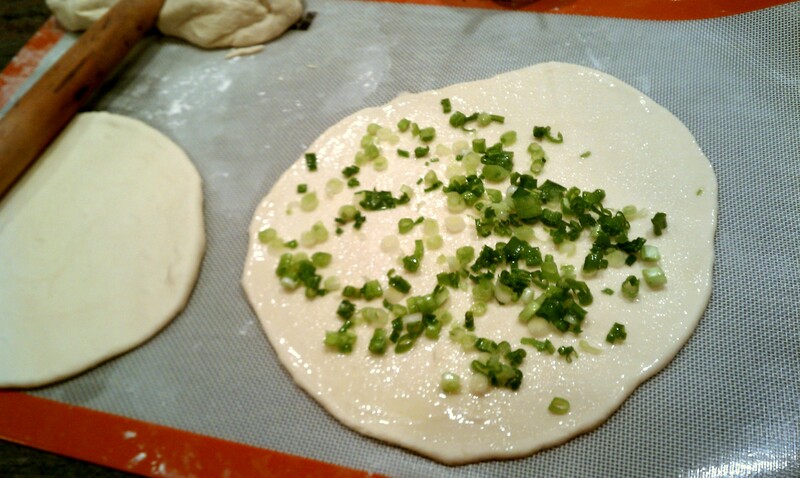 This is my mom’s recipe for da bing with scallions. 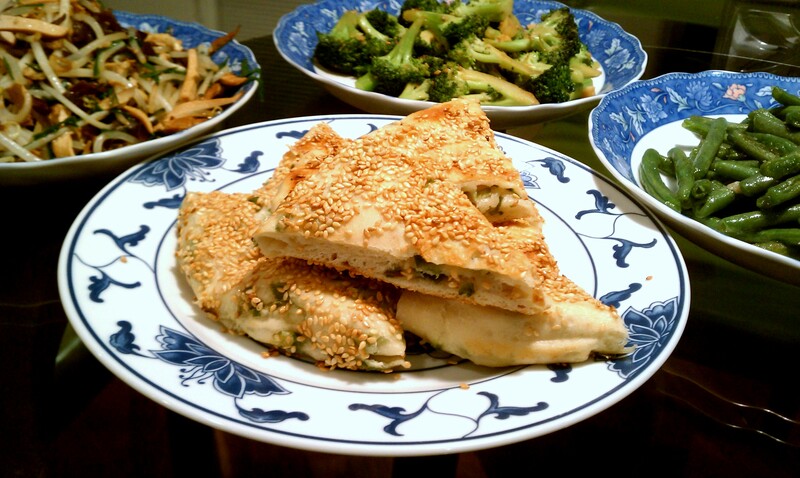 It’s made very similar to scallion pancakes, but uses yeast to give it some rise. As it is a “mom” recipe, it’s made mostly of visual directions and “to taste” instructions. I’ve tried to list the ingredients as accurately as possible. Place the yeast in 1/2 cup of warm water and sugar. Let sit for about 10 minutes, until frothy. Combine with the rest of the warm water and flour, and knead for about 20 minutes. 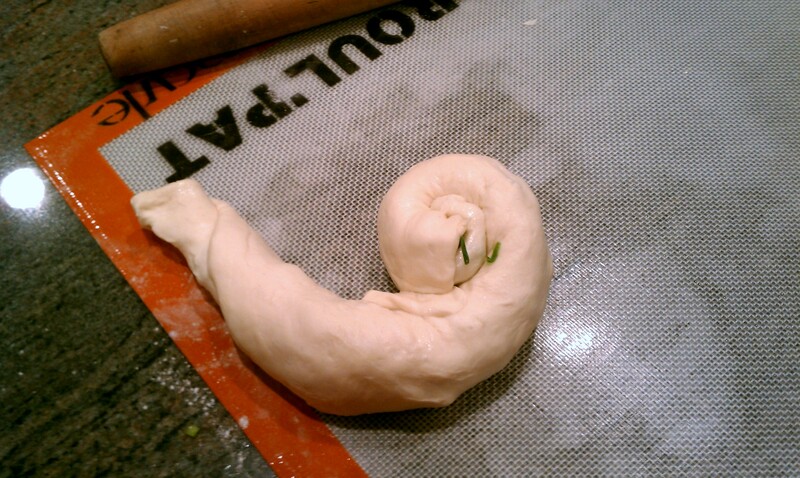 I’m sure you can do this with a dough hook on a stand mixer, but I’m not sure how long it will take. 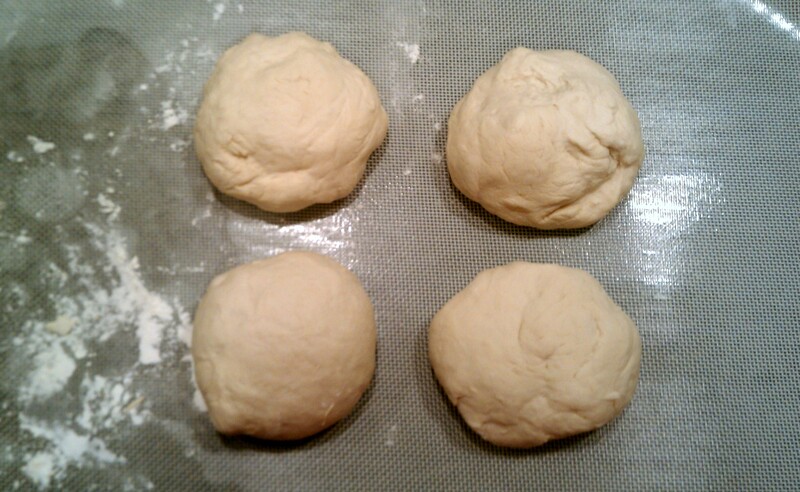 Divide dough into four balls of equal size and let rest for about 5 minutes. Roll out one ball as thin as possible. 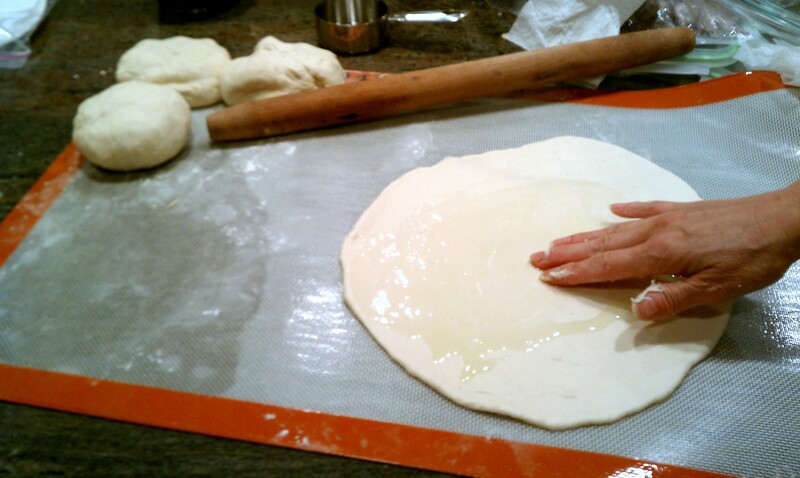 Spread about 1 tsp of oil evenly across the dough, then sprinkle generously with salt. 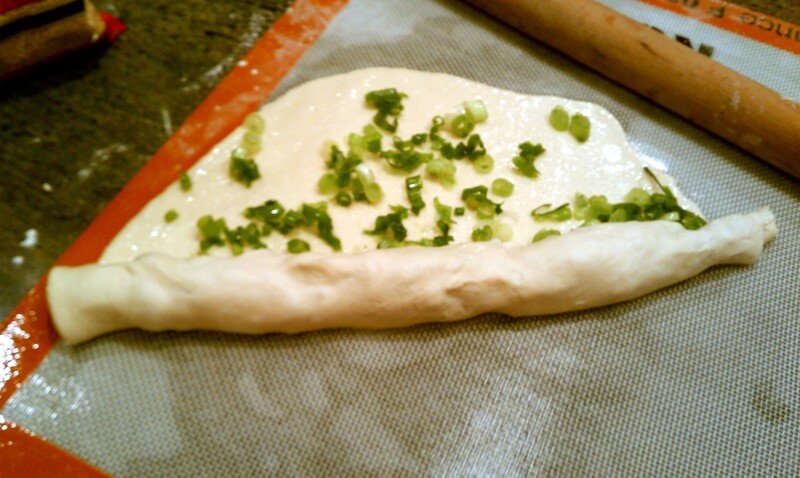 Spread 1/4 of the scallions over the dough, then roll into a spiral (see pictures). Let rest for about 10 minutes while you repeat the process with the other three balls of dough. At this point, my mom says that you can wrap the dough tightly in saran wrap and freeze for up to a week, but I haven’t tried it. 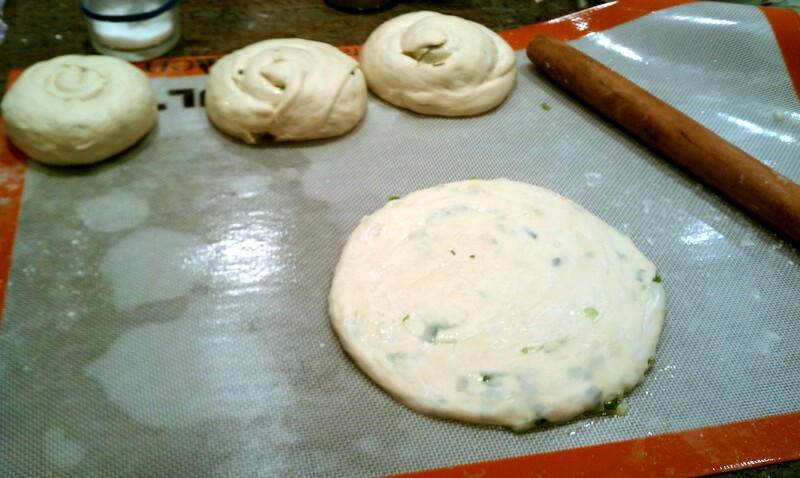 When ready to cook, roll out the spirals into pancakes about an 3/4 inch thick. 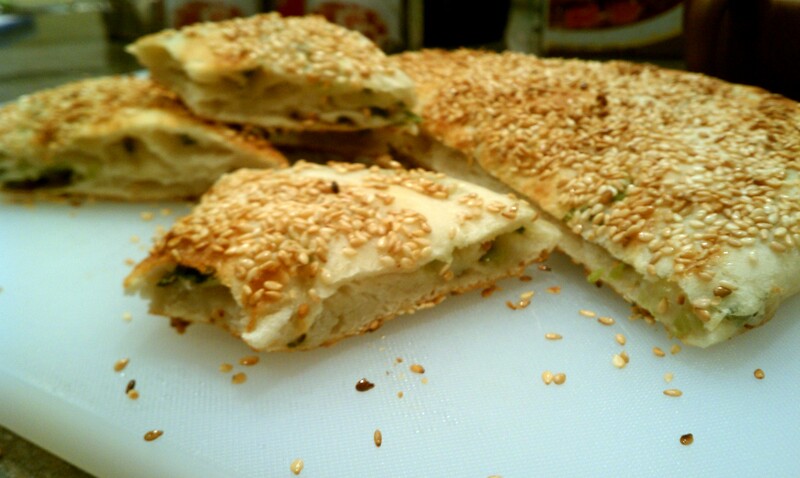 Cover both the top and bottom surfaces with white sesame seeds, pressing the seeds into the dough. Coat a large pan with a flat bottom in a small amount of oil (or cooking spray) on medium heat. 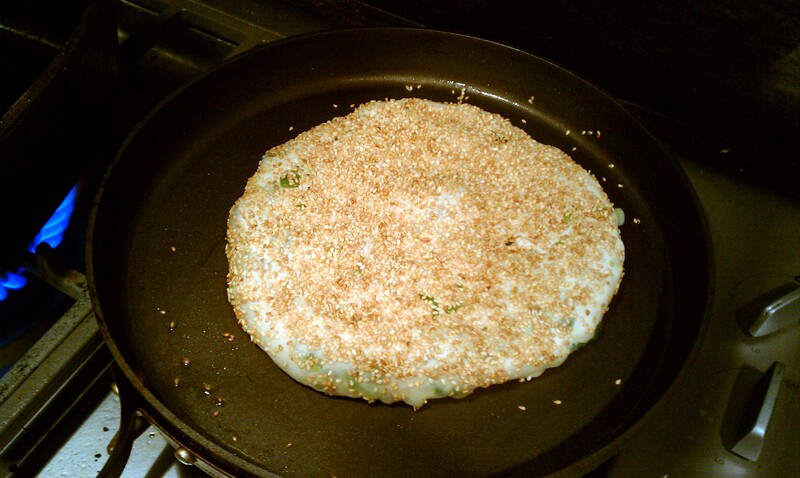 Make sure the pan doesn’t get too hot, else the sesame seeds will burn. Lay each bing individually in the pan and let cook each side until golden brown, about 7 minutes. Use the sides of the pan to cook the sides of the bing. The bing should rise slightly during cooking, and the sides should be hard-to-crunchy to the touch when it’s done cooking. Length of procrastination: About 1 hour.